My favorite is the Anguilla Hotel, La Sirena on Meads bay. We, the family - my two kids now 13 and 15 years old, have stayed there eight times (always for three weeks). Most of the time we stay in a villa in the nice garden. The Masshard Family (from Switzerland) is very friendly and nice. I raced in an Easter Monday Sail boat race with a Local Crew - it was Superb!!! I'm a Professional Olympic Sailor (Barcelona 1992 Starclass 2 Man Keelboat), our next trip is 17 December - 6 January. Many greetings from an island here in Germany (www.reichenau.de) under the Protection of the UNESCO World Hertiage Found! I just read your glowing review of La Sirena and I must say that things must have changed. 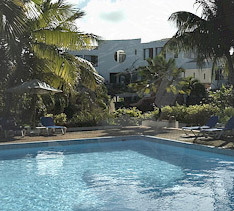 Our family stayed there this past winter 2008 and it was old and not up to Anguilla 5 Star standards, not even 4 Stars. The room was ant-infested. All in all, we've had much better stays in Anguilla. Thanks for helping me make a choice. It's nice to see the reviews of different Hotels from different people from all over the world. This will help me make a better decision on which hotels to stay in. We've never even walked inside La Sirena, but it sure sounds nice, Robi. Thanks very much for letting others know about it!